Mexico's Velas Resorts continue to push the boundaries of traditional expectations of an all-inclusive resort with dining fit for foodies. Velas Resorts has an incomparable connection to quality cuisine, from fresh local ingredients and innovative culinary creations to, now, gourmet cuisine-to-go. At Grand Velas Riviera Maya in Playa del Carmen, a basket of carefully selected gourmet foods can be packed for a couple or family to take when exploring the destination. Casa Velas in Puerto Vallarta takes it a step further with themed baskets for those with wellness, British and vegan tastes. At Grand Velas Riviera Maya, the Picnic in Paradise includes a bottle of red or white wine, four varieties of salads with house-made dressings, smoked salmon, French cheeses and charcuterie, fresh baked artisanal baguettes, and a selection of fresh roasted turkey breast, roast beef and duck terrine made from a special recipe of Michel Mustiere, Executive Chef and MaÎtre Cuisinier de France. And, of course, there are all of the condiments and nibbles to start off, including olives, capers, pickles and grapes. The best way to finish off a picnic? Sweets! Dessert options to vary based on daily chef creations. The Picnic in Paradise offering is included complimentary in the resort's nightly rate at Grand Velas Riviera Maya. At Casa Velas, guests can choose from three different themed picnic offerings: wellness, English and vegan. The wellness basket includes dried and fresh fruit, nuts, a flaxseed bread sandwich with Mozzarella cheese and cherry tomato with avocado oil, salmon rolls with goat cheese, pesto tuna tartar with pine nuts, and mini lychee tarts. The English Picnic is more traditional with Parmesan, Swiss, Edam, Camembert, Brie, Blue cheeses and charcuterie; homemade baguettes; fried Chilean sea bass; caviar; salmon and tuna tartar; fruit; and blackberry Clafoutis. A vegan basket features cabbage wrapped vegetables, fruit, endives with chickpea mousse, lentils with pineapple, strawberry sushi, beets, cilantro beans, orange tapioca pudding, and apricot rice pudding. 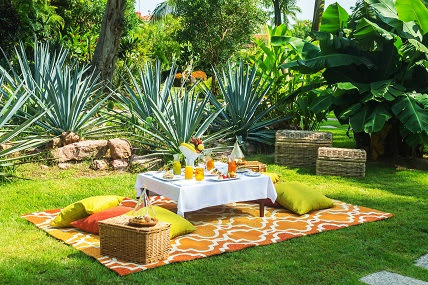 Accompanied by music (a live trumpeter with the Wellness Picnic), a bottle of Dom Perignon or Moet & Chandon champagne, sparkling and still water, and fresh juice, picnics at Casa Velas range from $280 - 400. Offering unparalleled all-inclusive experiences, the four Velas Resorts in Riviera Maya, Puerto Vallarta and Riviera Nayarit have earned more than 43 AAA Diamonds, including the prestigious Five Diamond Award. Other esteemed international awards for their services and facilities include Virtuoso's "Best Spa", Conde Nast Johansens' "Most Excellent Resort" and "Most Excellent Spa Hotel" and the American Academy of Hospitality Sciences' 5 Star Diamond Award. Properties include Casa Velas named the 8th Best Hotel in the World on The Expedia® 2013 Insiders' Select List, a boutique adults-only hotel and ocean club located on the Marina Vallarta Golf Course, and Velas Vallarta a family-friendly all suites resort and spa located on Banderas Bay, both in Puerto Vallarta; and the AAA Five Diamond Grand Velas Riviera Nayarit located in Riviera Nayarit. Completing the group is Grand Velas Riviera Maya, located five minutes from Playa del Carmen, offering the most sophisticated, ultra luxury all-inclusive resort experience in the Caribbean with jungle and beach settings. Velas Resorts feature spacious accommodations, spas, a unique culinary experience at a selection of restaurants, 24-hour in-suite service, fitness centers, personal concierge service, state of the art conference centers, extensive family programs, fully stocked mini bar and more. Velas Resorts are operated by Eduardo Vela Ruiz, majority owner, founder and president of Velas Resorts, with brother Juan Vela by his side, vice president of Velas Resorts.